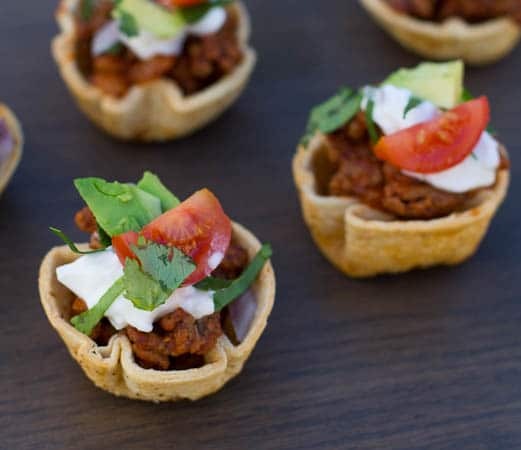 Mini Taco Bites are a fun and festive party food that will be gobbled up at your next get together, whether it be a holiday party or a day of watching football with friends. Kids will love them just as much as adults. And when I say mini, they really are mini. Just a one bite treat, or maybe two bites if you’re like me and take little bites. They take a little time to assemble, but the presentation is so worth it. All the components can be cooked or chopped ahead. This would also be a great recipe to put some little helpers to work in the kitchen. They would have a fantastic time putting these together, and may even be able to put their own creative mark on them. Use a 3-inch biscuit or cookie cutter to cut flour tortillas into small circles. Brush both sides with a butter/chili powder mixture and shape them into the cups of a mini-muffin pan. Bake until they are lightly browned. Once cool, they will perfectly hold their shape and you can place them in a ziptop bag if you’re not ready to assemble them right away. Fill each shell with just a tad of refried bean/cheese mixture and a spoonful of taco-seasoned ground beef. Then the fun really begins! Shower them with all kinds of toppings. The more color the better. I’ve used lettuce, tomato, red onion, avocado, cilantro, and sour cream. But use whatever suits you. Black olives, more cheese, jalapenos, and salsa would all be great. Everyone will have fun eating these Mini Taco Bites. 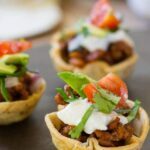 Bite-sized taco treats filled with refried beans, seasoned ground beef, lettuce, tomato, sour cream, and avocado. Mix together melted butter, garlic salt, and 1/4 teaspoon chili powder. Cut tortillas with a 3-inch biscuit cutter or cookie cutter. You should get 3-4 circles per tortilla. Stack tortillas, wrap in a moist paper towel, and microwave for 20 seconds to soften. Brush both sides of tortilla circles with butter mixture and press into cups of a mini muffin pan so that they take the shape of the muffin cup. Bake for 15-18 minutes. Cool in pan 5 minutes and then remove to wire rack to cool completely. In a large nonstick skillet over medium-high heat, cook ground beef, breaking it up with a wooden spoon. When most of the pink is gone add onion. Cook 2 more minutes. Add chili powder, cumin, and cayenne pepper. Stir for 30 seconds and then add tomato sauce. Simmer until thickens and then season to taste with salt and pepper. Place refried beans and cheese in a small microwave safe bowl. Heat 30 seconds and stir. If cheese is not fully melted, heat in 20 second increments until cheese melts. Place a small amount of bean mixture on bottom of each taco shell. Top with small spoonful of meat mixture. Sprinkle with lettuce, tomato, red onion, avocado, and cilantro. Add small dollop of sour cream. This entry was posted in Appetizers and tagged beef, finger food, party food, Tacos. Bookmark the permalink. After having tacos last night I have lefovers.these mini tacos will be perfect to use up my taco meat. Had tacos last night. Being single I have leftovers. This mini taco will be perfect. Need ideas for fillings other than tacos! I’m wondering–instead of baking the taco shells, could you place the beef mixture with the onions, and cheese and heat it all together or will the shell stay soft instead of crunchy? I would like to prepare it in the muffin tin and then take it to my brother’s house to finish the cooking process there. How long in the oven? Thank you so much Peter! Hope you have a great weekend! I love these little bites! Actually, I am loving everything I am finding on your blog. Looking forward to reading more! Oh my goodness! 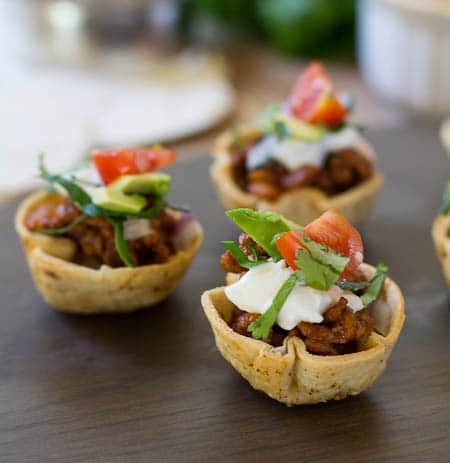 What a fun and adorable way to serve up some Mexican flavor! Thank you for sharing these! 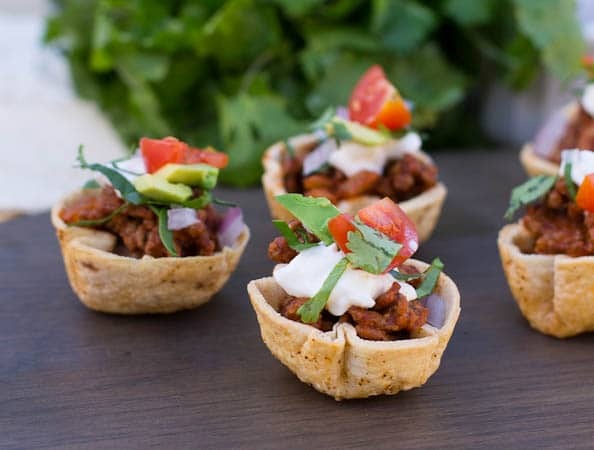 I love little bite sized appetizers, especially taco inspired ones! These would definitely go over with everyone. Love them, Christin! These are adorable! I love eating things in miniature — it makes everything feel so much more fun and festive. 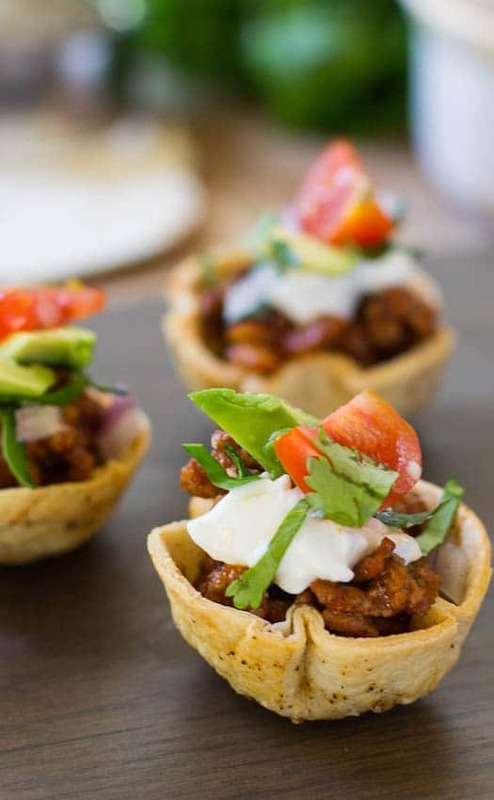 But I never thought to use a cookie cutter to make small tortilla cups — great idea!